What do a day at the spa, a course of PTSD treatments for war veterans, and a treatment protocol for a given illness have in common? It would seem like very little on the surface, except that they all represent some sort of path to a better state of wellness. However, there’s a small lightning storm of sorts coming out of Washington state, in the form of a modality called the Blu Room that supplements these diverse treatments. Unlike other forms of colour therapy, this virtually side-effect-free use of blue light has been widely studied at universities and medical institutions from mainland China to Israel, several European countries, and the United States. 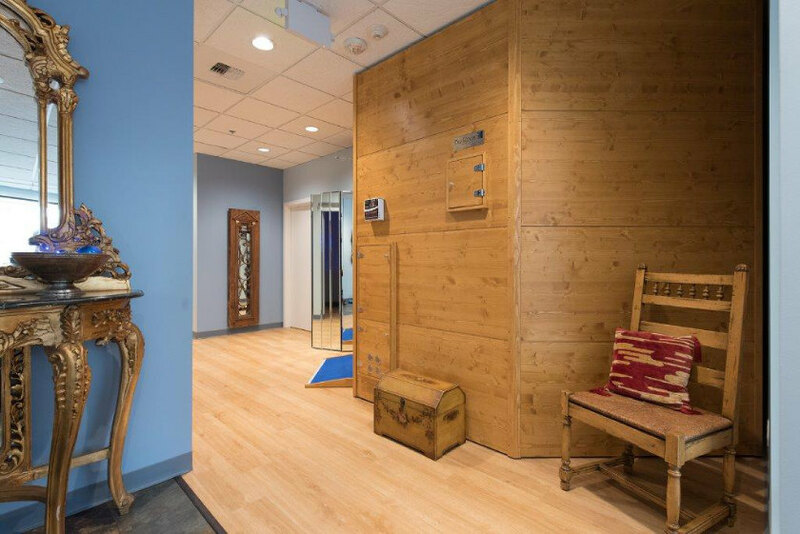 The “treatment” in the Blu Room format combines UVB light (naturally occurring in sunlight) and blue lights, with exposure tailored to each patient. Though the technology is only two-and-a-half years old, it is already being used as an adjunct for everything from cancer treatments to psychological rehabilitation, IV drips and vitamin injections, to something that will nicely intensify the effects of a massage or other spa treatment. Also, in contrast to other forms of colour therapy, what you see in the room (conceptualized by new-age teacher and author J. 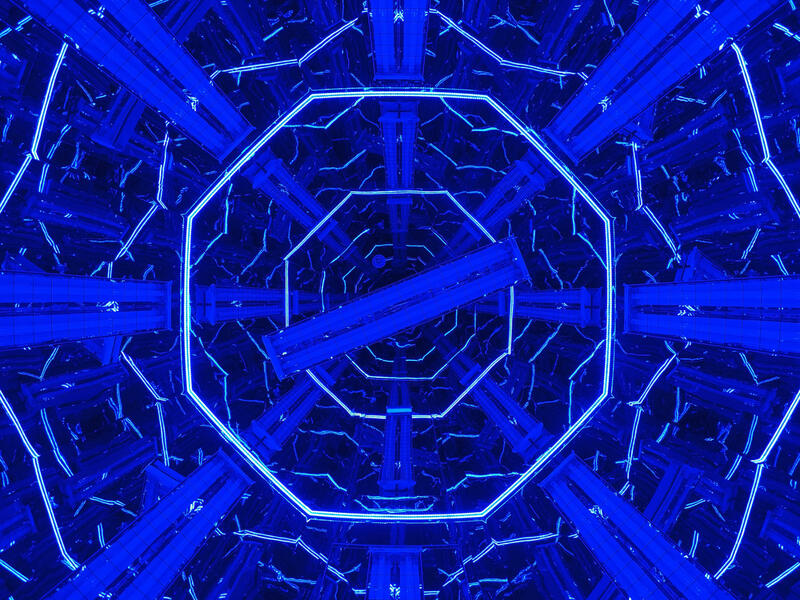 Z. Knight and Dr Matthew Martínez) is actually what you get: an octagonal birch wood cabin outfitted with mirrors, tiny blue lights, and a set of long UVB bulbs in the middle of the ceiling. The arrangement creates a pleasing tunnel effect, with the patient or client lying in the centre and looking straight up, with eye protection during the prescribed minutes of UVB light exposure during a session. Better still, clients can stay dressed during the sessions and still receive the desired benefits. No matter what condition is being addressed, every session lasts about 20 minutes, with uvb light exposure gradually being built up. A more relaxed state is the most immediate effect Blu Room clients experience. According to Mike Wright, operations manager for Blu Room Enterprises in Yelm (30 minutes outside Olympia, Wa. ), divergent but specific results have been reported by users after repeat visits. They run the gamut from reduced stress and a calmer state of mind, to better sleep and alleviated symptoms for those suffering from Parkinson’s disease, dementia, autism, various cancers, bronchitis, arthritis, post-traumatic stress disorder and more. As I leaf through an impressive volume produced for Blu Room headquarters, I find vitamin D production is an important common denominator in the results experienced by early adopters to the Blu Room. Vitamin D naturally occurs in humans through sun exposure, and its biological effects include preventing oxidative damage to nervous tissue and detoxifying pathways between the nervous system and the brain. It certainly helps explain why the technology has the potential to help so many different individuals. Furthermore, UV light is used for various sanitization purposes, from purifying water to acting as a disinfecting agent in washing machines, dishwashers, and special brooms used in medical facilities. There is also a sound component in the Blu Rooms that completes the transformative potential of the treatments. On the other hand, with so many eastern and western forms of medicine competing for the attention of the public, it may be easy to understand why there is some skepticism and it may be a while before Blu Room becomes a mainstream modality across the US, New Zealand and Australia. However, Blu Room centres have already gathered strong followings in Argentina, Germany, Austria, M�xico, Japan, Taiwan, and Canada. In addition to prepping questions for pioneering spa and clinic owners venturing into this wild “blue yonder”, I thought about what my four Blu Room sessions in different settings (day spa, medical clinic, wellness centre, and the company headquarters and showroom) would accomplish. While I am generally healthy, there were some things I was hoping to address: a constantly twisting left ankle coming from a series of injuries; residual lower back pain stemming from a 1992 car accident; writing-induced stiffness in my shoulders and back; and stress reduction coming naturally from living in Los Angeles. When I arrived at my first stop, Spa Celeste on Mercer Island, I decided to surrender and let the Blu Room do its magic. 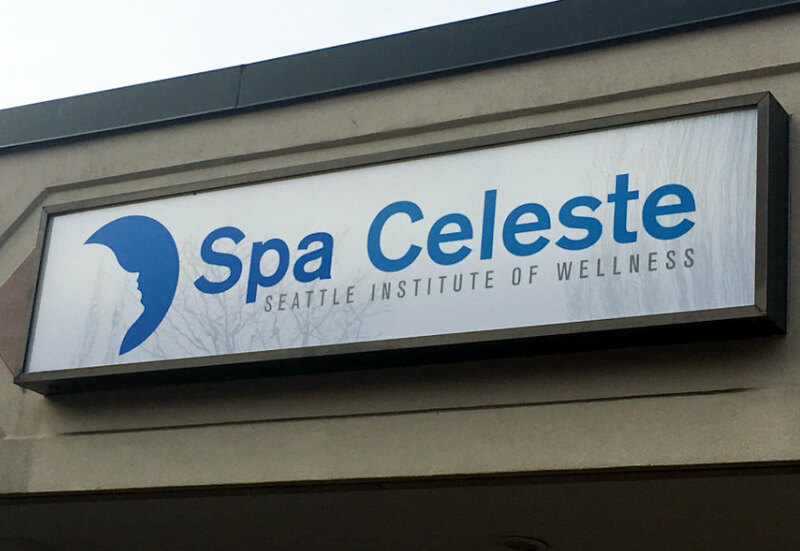 As I chatted with Spa Celeste’s owner, Susan Janus, about her being the latest Blue Room operator in the Seattle area, a lot of thoughts went through my mind. Could this technology benefit my autistic brother, or help my 89-year-old father regain some of his mental sharpness? Spa Celeste already feels inviting from the moment you set foot indoors. 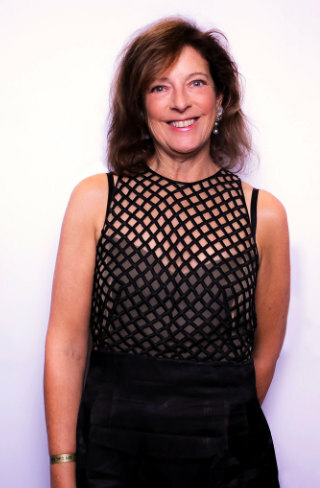 Right: Susan Janus, Spa Celeste’s owner. The next minute, I focused on Janus, who showed me around her just-opened space, awash in a blue shade falling between periwinkle and hydrangea, and outfitted with restored antique door planks and furnishings, floral and dragonfly-inspired artwork, and large, sparkling geodes. The space also includes a dedicated journalling room where clients can set their intentions for their sessions before going into one of the Blu Rooms. During our tour, Janus said she opened her operation, not only because of her own positive health improvements with repeated Blu Room sessions, but also in response to the demand to bring the technology closer to the Seattle city centre. Before stepping into the room, we agree constant brain chatter is one of my “things”, and Janus explains that the session will put clients into a theta-brainwave state associated with restorative sleep that, in turn, can help cut through the brain chatter and enable to think on a higher level. Taking this at face value, I go into the blue tunnel and relax. Twenty minutes later, I am feeling very mellow and wish I could hit the snooze button for a few more minutes. In the late afternoon, I make the drive from Seattle to Olympia, finding myself taking in more details than I normally would. I find myself enjoying the extensive stretches of roads with their canopy of pine trees occasionally broken up by quaint Pacific northwest villages. 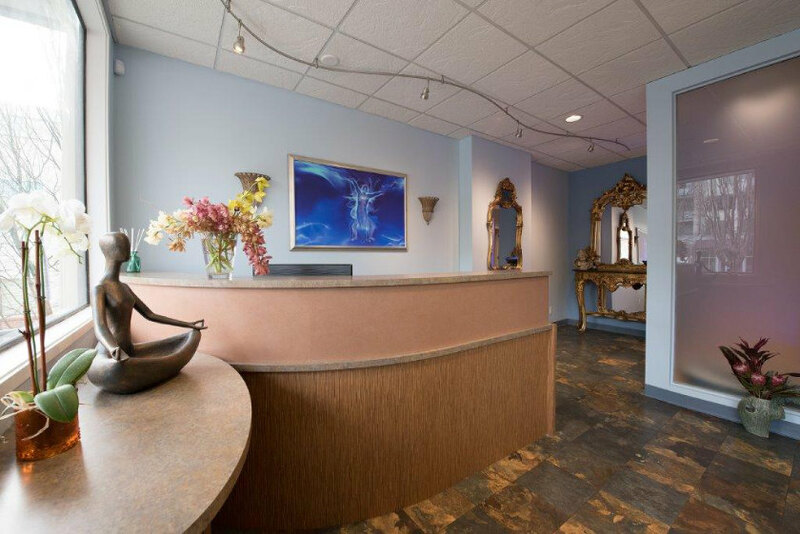 Absolute Health Clinic, just a few minutes from downtown Olympia, has some of those nice woodsy touches, but is clearly a medical clinic with its comparatively simple décor and organization. 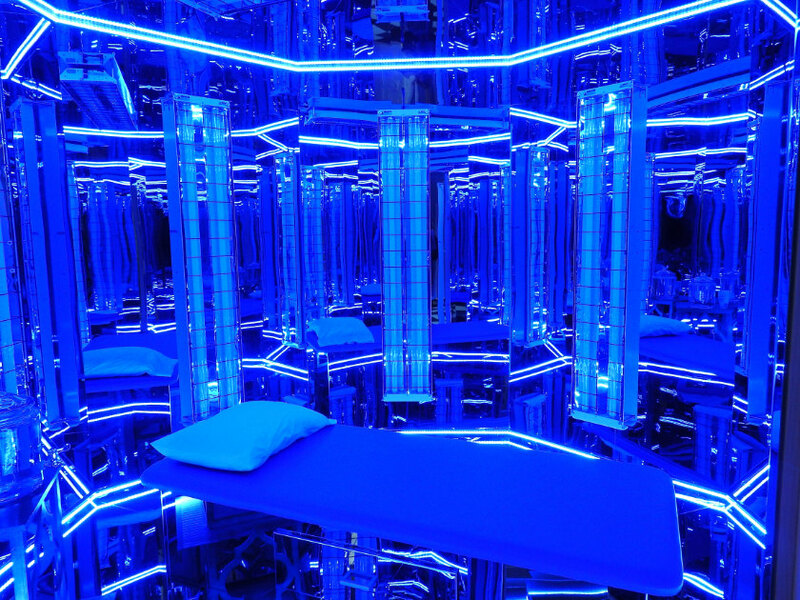 In addition to its full-scale Blu Rooms, there are rooms for IV drip treatments that are also appointed with strings of blue light that provide continuity for the experience. Austin Hess, office manager of Absolute Health Clinic, is not just an employee, but also a client. He provided his own testimonial as well as praise for Martínez’s and Knight’s efforts to bring the technology to more people. When he developed rheumatoid arthritis, his first step was to move from Los Angeles back to Washington state. While that helped, he still found himself unable to walk or function in the ways he did before moving into more involved treatment. He said that when he combined Blu Room session and vitamin and stem cell IV drips with his western medicine protocol, he made leaps and bounds in his health. My UVB exposure was ticked up to six minutes for the second session at Absolute Health Clinic. This time, I fell into such a relaxed state I almost could not hear the music. I could still see blue even with my eyes shut. I emerged, drank blue light-filtered water and wondered if it was the room or the power of persuasion that made my recently resprained ankle feel less painful and more stable and my neck less stuff. Perhaps, like Austin’s situation, getting out of LA may have had something to do with it. Nevertheless, there was something delicious about the stiffness going away so effortlessly. U Wellness Center in Yelm, Wa. 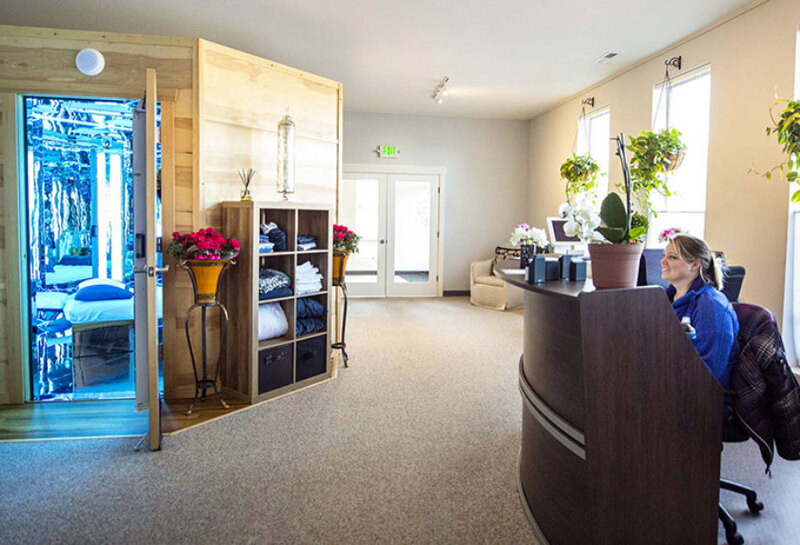 Shannon Paulos, co-owner of the U Wellness Center in Yelm, describes the Blu Room as, ‘Not eastern or western medicine, but something out-of-the-box,’ given its very current origins. We meet first thing in the morning at her centre to discuss how her business became the first Blu Room open to the general public. Her small campus is an even hybrid of spa and medical clinic. To experience the effects of the Blu Room in this setting, I am scheduled for an hour massage followed by a room session (with uvb exposure dialled up to nine minutes), and 20 minutes of ‘BrainTap’ therapy in her office’s serenity room. The BrainTap apparatus could almost be described as a portable blue room, combining headphones loaded with ‘10-cycle holographic music’ and a blue light shade covering the eyes. Paulos explains this add-on gives clients the perfect combination of light and sound to balance the left and right sides of the brain. Paulos, who divides her time between Yelm and Salt Lake City, was already well acquainted with western and holistic medical modalities. She previously owned a Pilates studio and worked in the offices of her husband’s orthopædic surgery medical practice in Salt Lake City. 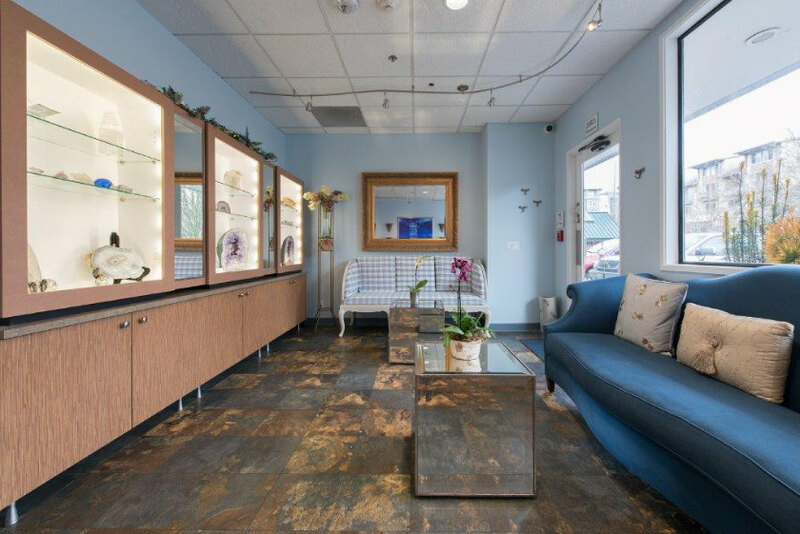 After learning about Blu Room and discussing possible benefits with her husband, Dr Lonnie Poulos, she was determined to speak with Martínez about having a Blu Room installed in her facility, which would make her the first facility in the state and the US to offer Blu Room. As a full-fledged MD was required to monitor the success of clients and do research on their results, her husband stepped up and became as immersed in its results. My last stop is the Blu Room showroom, up the street from Poulos’s establishment. After lunch, Wright tells me more about us war veterans undergoing numerous Blu Room sessions to mitigate the symptoms of PTSD, and about kids from a local special needs’ school receiving treatments. Though my final session is just the blue lights themselves, without UVB, I am feeling very rested by this point.